Please note that the EBL system was moved to its new location at Nanotech West on west campus along Kinnear Road. The IMR Shuttle services provides hourly access to/from central campus, door-to-door. The IMR Shuttle schedule cam be found here. The move was intended to bring greater access and tool support in order to accomdadate the growing user base. 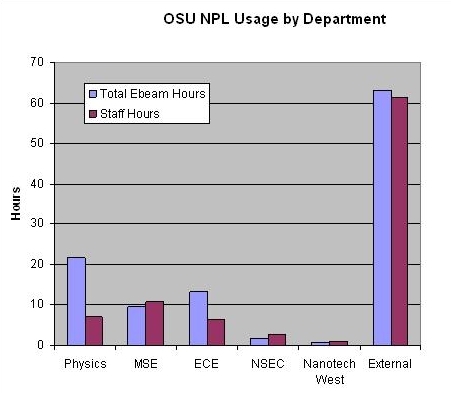 The Nanotech West facility should provide a more stable infrastructure leading to reduced tool downtime and more staff support, although Ms. Bross will still be the principle point-of-contact for new and current users. Further, the proximity of a dedicated scanning electron microscope well suited for imaging nanoscale insulating resists will be added that will certainly improve and expedite post-development analysis, providing faster iterations of your experiments. 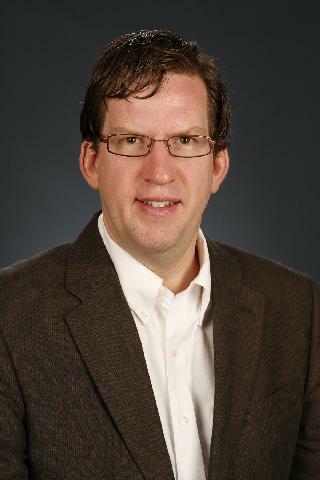 The new SEM is courtesy of Wright Center of Innvation on Photovoltaics Innovation and Commercialization (PVIC) which includes a significant infusion of leading edge process equipment for semiconductor and related materials. Berger is a key member within PVIC, developing organic photovoltaics and related materials. 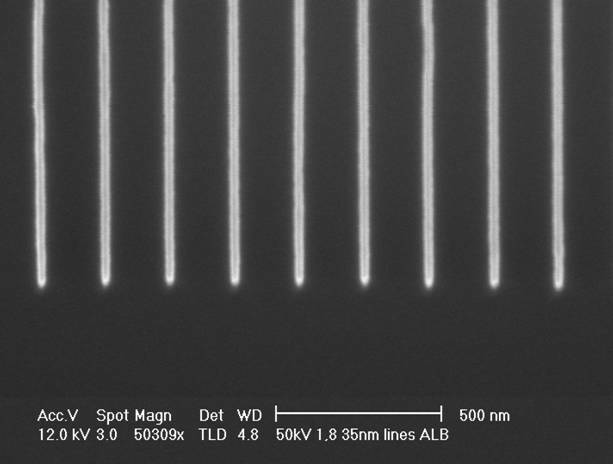 A monthly diary of EBL activities within the Nanoscale Patterning Lab (incl. May 2006). 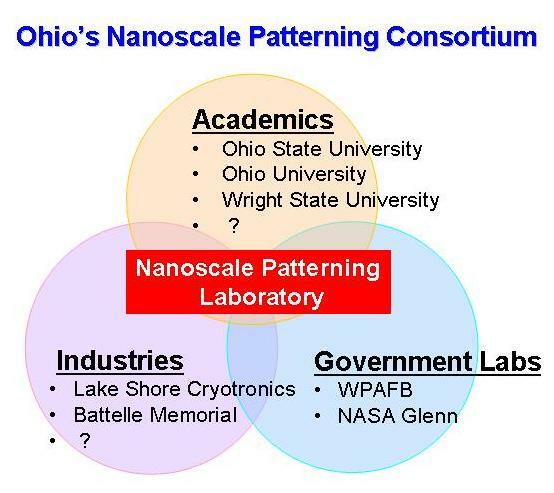 A summary of standard EBL processes provided by the Nanoscale Patterning Lab (Under Construction). Directions to Dreese Laboratory at 2015 Neil Avenue with the EBL facilty in Room 095H Dreese, housed within the NanoMPC cleanroom (095 Dreese) in the basement of Dreese. Archive of images and notes from the Nanoscale Patterning Laboratory installation, renovation and tool acceptance testing. 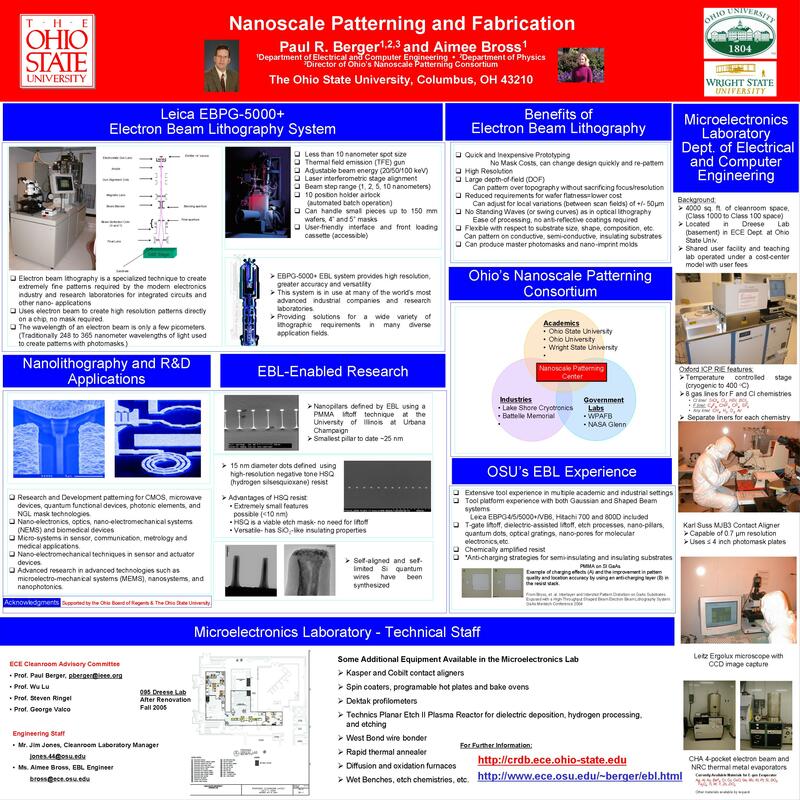 Poster showing overview of EBL Lab and NanoMPC facility. A tour of the labs affiliated with the Berger research group. Our first year of operation has already demonstrated a wide and healthy impact upon the Ohio State community, and beyond, crossing departmental, college, university and state boundaries (see below). The new electron beam lithography (EBL) facilities are in the process of being installed into the OSU's Microelectronics Cleanroom Laboratory. The entire facility was supported by the Ohio Board of Regents and equates to a multi-million dollar investment by the State of Ohio and the Ohio State University. The hiring of key university staff with an extensive knowledge of electron beam lithography in both academic and industrial settings will serve a broad customer base well to service your individual needs. In layman's terms, it is a sophisticated tool for patterning samples at the nanometer scale all the way down to single digit nanometers! Samples can be virtually anything that can exist in a vacuum, and that has a relatively planar surface. The process works just like your TV, assuming you do not own a flat-panel set yet. Your cathode ray tube (CRT) creates an electron beam that is scanned, or rather rastered, across a phosphor-coated screen by voltage controlled plates, providing you with a suitable picture image. 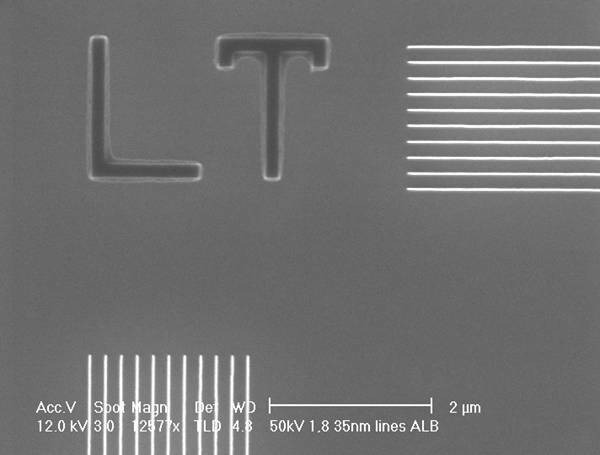 In our case, the electron beam has a very small spot size and its position on a sample can be controlled also to single digit nanometer precision. The sample is coated with a material, generally from a polymer based solution, that changes its properties when it is exposed to the electron beam. Then with a process of developing, similar to photography, the exposed image is developed in a solution. A myriad of other processing techniques can then be performed to the sample that will alter the samples properties only within the specified regions. One example of this type of processing is the manufacturing of a computer chip. For further details, see the Leica brochure (2.7 Mb) . The new facility is open to all users, including academic institutions within and outside Ohio, private companies and government laboratories. The new facility will operate on a cost center model and will incur user fees to defray operational costs. The staff EBL engineer (see Ms. Bross's contact info above) will be available to work with outside users for either training users or running your jobs directly. Ms. Bross supervises the daily operation of the EBL system. The EBL system is now fully on-line and accessible to the general public. Please contact the EBL Engineer, Ms. Aimee Bross (contact info above) to determine your needs. A full cost structure is articulated below and is commeasurate with peer institutions. To be determined, when a user base requesting this service requires it. The facility operates as a cost-center and thus fees defray operating expenses. As operating expenses are a moving target, the users fees will be reviewed annually and altered accordingly. The preferred format for job submission is the standard GDSII, but other formats can be accepted. Please contact the EBL staff to determine compatibility. For those academic users who do not have a suitable CAD layout editor, we are looking into providing limited access to software that would meet your CAD layout needs. We also hope to offer this service to off-site users. Below are early (12/19/05) photomicrographs of test patterns written during the tool acceptance testing. Note, that the field emission source permits a sub-10nm spot size, and thus we have not pushed the system to its lower resolution limit yet. Work to date has been at coarser resolutions only. 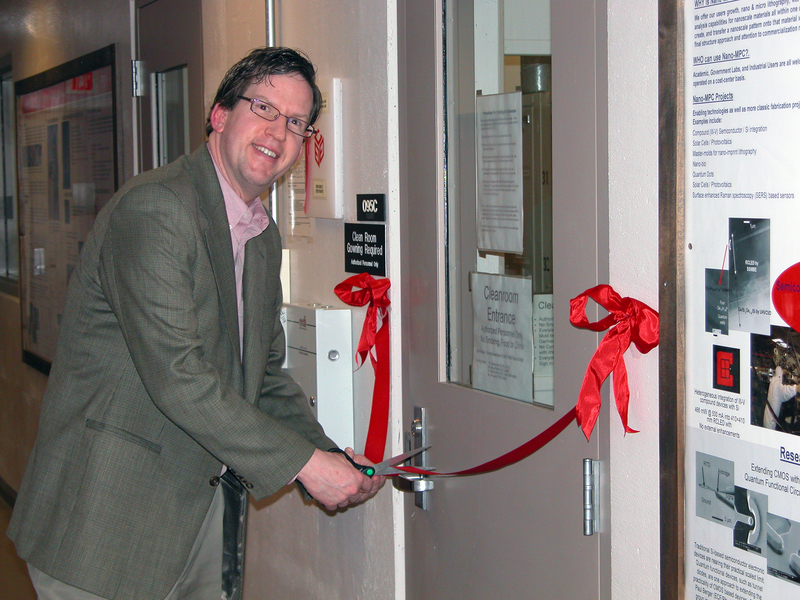 Below are a few recent photographs of the EBL lab space (February/March 2005). Below are a few images from the April 3, 2006 Kickoff Celebration. Last updated September 17, 2007.